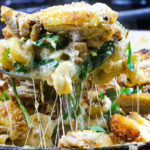 Creamy, garlicky pasta with sun-dried tomatoes, lots of fresh garlic, fresh spinach and topped with crispy-skinned chicken thighs. You’re not ready. Season the flesh side of the chicken with kosher salt, black pepper, smoked paprika, granulated garlic and onion, dried thyme and oregano. If you need more spices, please add it. You wan’t good coverage. Drizzle a little oil on top of the herbs and spices, and massage it into the chicken. Make sure you get in all the nooks and crannies. Flip the chicken over, and sprinkle kosher salt all over the skin of the chicken. We don’t want to add any other seasonings to the skin side, because we don’t want them to burn. Place a large deep-sided skillet or braising dish (at least 4 quarts) over medium-high heat. When it’s nice and hot, add the chicken to the dry skillet skin-side down. Thighs have enough fat on their own, you won’t need to add any additional oil at this point. If using a leaner protein, like white meat, please drizzle with oil first so the meat doesn’t stick. Let the skin sear and get crisp, this will take about 7 to 8 minutes. You’ll know it’s ready to flip when it’s easy to flip the chicken over. There will be a SLIGHT resistance, but if it’s resisting too much, it’s not ready. Cook chicken flesh-side down until cooked through, about 5 to 8 more minutes. Use an instant-read thermometer if you’re unsure. When chicken is done cooking, place it on a large plate and cover with foil to keep warm. In that same pan, reduce the heat to medium. Pour off all but 1 tablespoon of residual chicken fat. Add the butter, and one tablespoon of olive oil. When the butter starts to sizzle, start scraping up any brown bits on the bottom of the pan leftover from the chicken. Add the crushed red pepper flakes and cook for 20 seconds to infuse the fat. Add the onions to the pan, and cook until slightly softened, about 3 minutes. Sprinkle the onions with a generous pinch of kosher salt and black pepper, then the dried thyme and oregano. Allow the dried herbs to bloom, about 2 minutes, stirring constantly. Add the sun-dried tomatoes and saute for about 2 to 3 minutes. Next, toss in the garlic and cook for just about 30 seconds. When the garlic is fragrant, add the fresh thyme and fresh rosemary. Stir it in and cook for just 10 seconds. Pour in the white wine while scraping the bottom of the pan to loosen any bits. Allow the wine to reduce for about 3 minutes, or until you can leave a quick dry trail with the edge of your spatula/wooden spoon. Pour in the chicken stock and half-and-half (I had both in a large measuring cup to make it easier), stirring to combine all ingredients. Next, add the cavatappi pasta, making sure it’s submerged. Add in the granulated garlic and onion, stir it in and bring the pasta up to a boil. As soon as it starts boiling, reduce the heat to medium-low (closer to low). The pasta will cook gently in the liquid, while simultaneously thickening it. This will take about 10 minutes or so, but be sure to test the doneness of your pasta often to see where it stands. If your liquid is evaporating faster than the pasta is cooking, simply add a little more half-and-half in stages. Make sure you stir this mixture often, to make sure nothing is sticking to the bottom of the pan. You may need to adjust the heat during this step, so please do so. When the pasta is tender and toothsome, but not mushy (al-dente), turn the heat off. The sauce will continue to thicken as it stands. Stir in the parmigiano-reggiano and pecorino-romano cheeses until well combined. Now’s the time to taste it. If you need to add salt and/or pepper, do it. Fold in the spinach until it’s wilted from the residual heat. Next, add the fresh basil and parsley and gently stir to combine. Stir in the mozzarella cheese (I forgot to take a picture of this step). Taste it again to make sure it’s seasoned right. Your finished pasta should be creamy, smooth, and cheesy. It shouldn’t be dry. If it’s not smooth or creamy, add a touch more half&half or chicken stock to loosen it a bit. Chop your chicken into desired pieces or strips, and place on top of the finished pasta. Serve immediately with your favorite side salad, or crusty garlic bread. If you’re unable to find boneless skin-on chicken thighs, you can debone it yourself. Or, if you’d rather skip the deboning drama, just roast the thighs separately in the oven (uncovered) at 425 F for about 35 minutes, or until meat registers 175 F internally. You can any kind of chicken (or protein) here, but adjust cooking times as needed for white meat vs. dark. We’re not using a full box, so please weigh your pasta if you can. I like cavatappi because it expands nicely, has lots of grooves for sauce-cling’age, etc. If you are unable to weigh your pasta, you could use the whole box of cavatappi. Just add more liquid (stock and/or half&half) as it cooks. Always grate and/or shred your cheese fresh. Don’t use pre-packaged shredded cheese, because it doesn’t melt well and isn’t nearly as delicious. For the love of God, please don’t use that “1,000 year shelf-life woodchipper parmesan cheese” in the green canister. That would be disrespectful AF!